You did not miss my Harvest Monday post this week because Dave and I were off hiking the northern portion of The Lost Coast trail and I didn't have time to write the post. I'll cover 2 weeks of harvests next Monday. to cobbles and everything in between. There are stretches where you can not pass at high tide so it is necessary to carry a tide chart and time your travel for the window around low tide. We spent 3 days and 2 nights on the trail and the nights before and after the hike in Shelter Cove. It was foggy the entire time but we didn't mind because the fog kept the temperatures in a very comfortable range. But of course the sun came out the day we left. Enough of the non-gardening stuff and on to what's new in the garden in the past week. 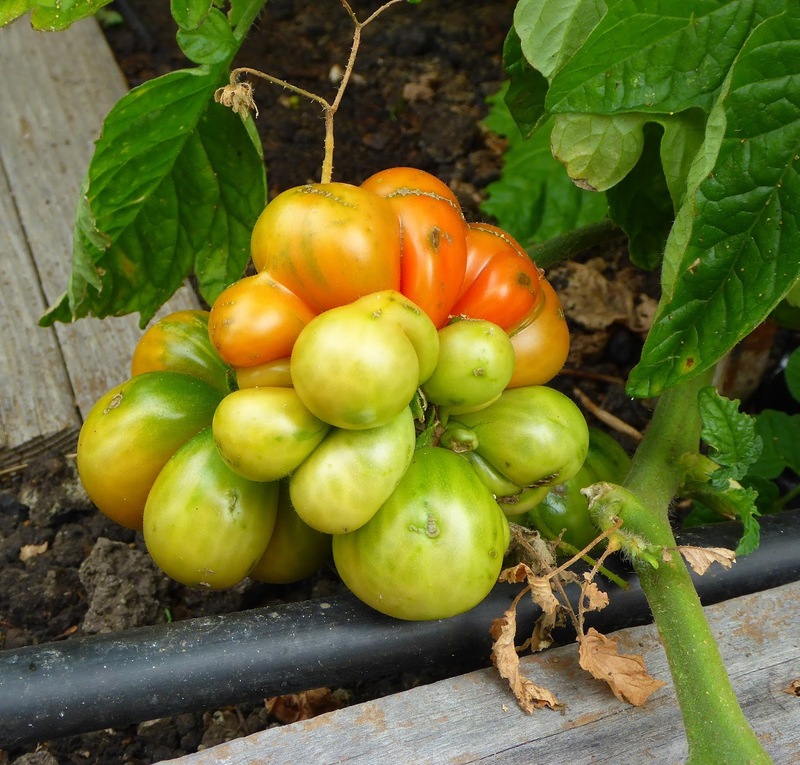 Still waiting for Orange Jazz tomato to ripen, but it is showing some color. And a few more peppers are starting to color up. The small fruited Aji Amarillo peppers from Artisan Seeds are starting to ripen, while the Aji Amarillo Grande peppers have hardly even begun to set. I may end up having to pot up the Grande plants to overwinter them. I noticed that powdery mildew is infecting some of the pepper plants. Etiuda seems to be quite susceptible and Lady Bell is pretty heavily infected as well. The fog has been particularly heavy this month, probably because of the smoke from the Soberanes fire, and the daytime temperatures have been cooler than normal as well. Powdery mildew is infecting my broccoli and kale too. I sprayed all the pepper plants, the kale, and the Batavia broccoli plants with an Actinovate solution yesterday. The Mareko Fana plant that I'm growing this year seems to have a slightly different pod than the plants that I grew last year and the plants are not as tall. There is some diversity in the peppers, it's a landrace variety rather than a more uniform selection. Most peppers ripen to brown, but some to red and most peppers have thick flesh while others are thinner. It will be interesting to see how these turn out. The other significant development in the pepper patch is that the critters have developed a taste for the leaves and shoots of the pepper plants. 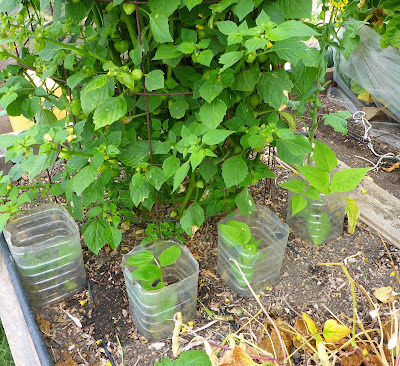 I set traps all over the garden at night, which is when most of the damage is done, but I've not been catching the culprits that are munching the pepper plants, although I did get a couple of big ones that were raiding the strawberries. 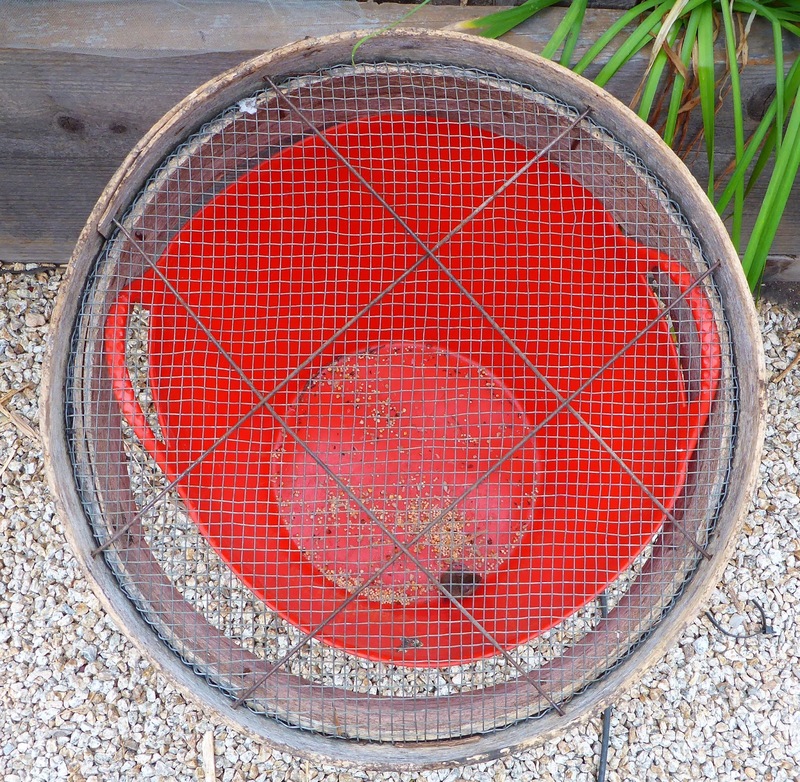 I have, however, figured out a way to catch the littlest rats that don't spring the snap or other traps. I'm using one of my larger Tubtrugs. I found that they will crawl into the trug if there's something yummy to eat in there, but I also found that they can jump quite high for their size to I have to put something over the top to keep them trapped. So far I've caught at least 10 of them this way, I'm losing count. 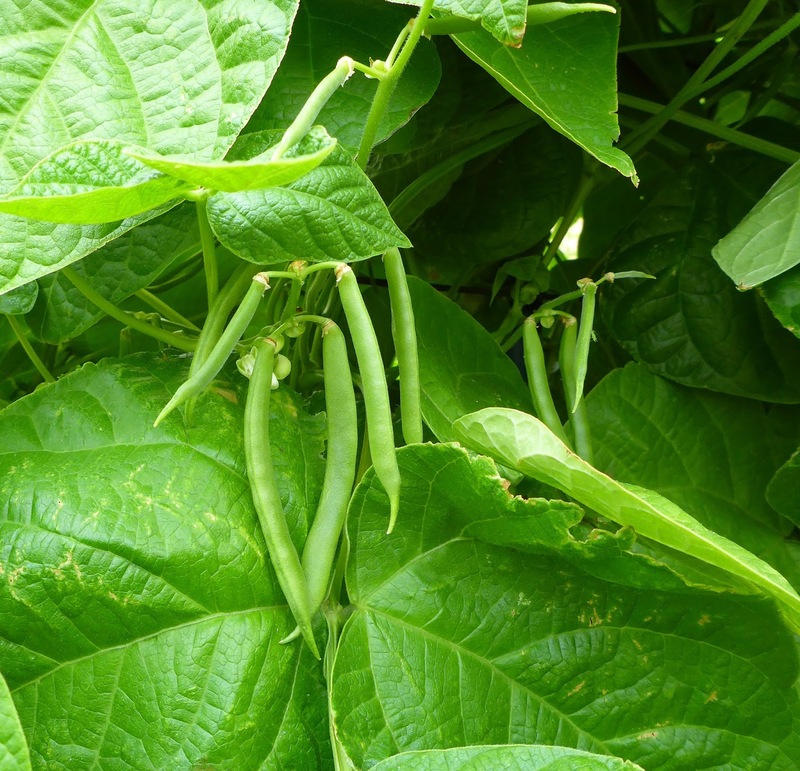 Also on the munching menu are the Hopi White Tepary bean plants. I suppose Tepary bean plants must be pretty tasty. I had to erect a barrier around the Blue Speckled Tepary plants to keep what is most likely the rabbit from plowing through them. And I'm guessing that it's the Damn Rabbit that is reaching up to munch the Hopi White. So far the tulle fabric is keeping the munchers out of the pea patch. The Puhwem corn started to tassle this week. One more pepper update. The IPK P 852 (Italy) pepper plants that I belatedly set out in a fabric pot are really starting to fill out and have flower buds. 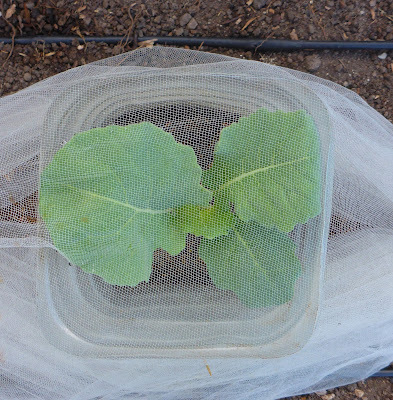 The Romanesco Broccoli and Purple Cape Cauliflower plants that I set out last week are taking off. The parsnips that I sowed back on August 15 are finally emerging. The kohlrabi plants are also coming along nicely. I harvested all of the lettuce the day we took off for our trip. It all looked to be on the verge of bolting and I know that it will keep quite well in the fridge for a couple of weeks. The fridge is stuffed and salad is definitely on the menu. 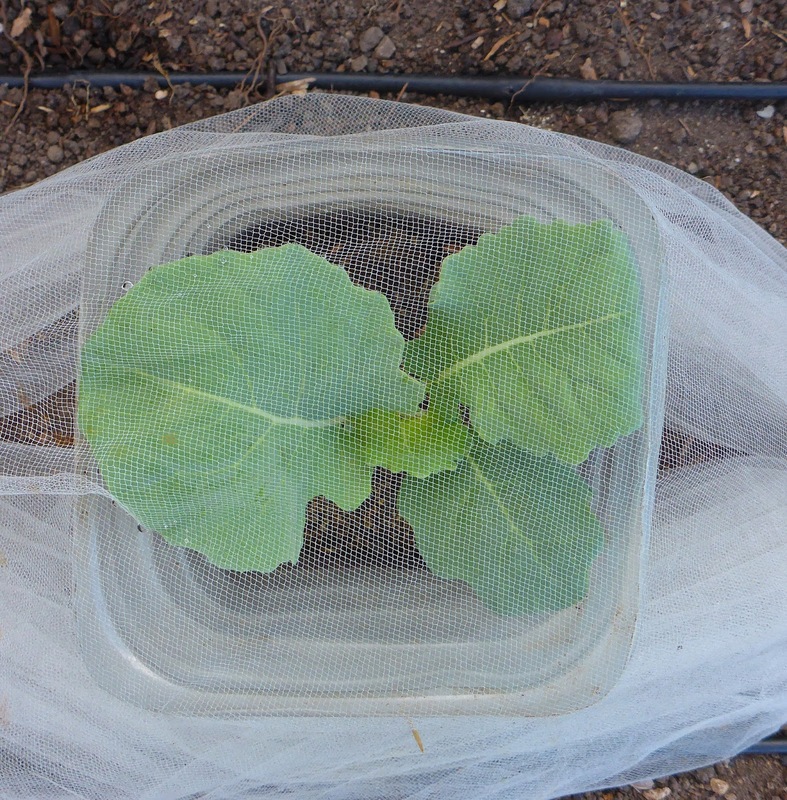 As I mentioned earlier, the broccoli plants were infected with powdery mildew so I treated them with Actinovate. But before the treatment I cut off most of the foliage which made it easier to spray and it also makes it easier to see the side shoots and it gives the shoots more space and light. I cut the overgrown basil plants back yesterday and aim to get them out of the garden this week and sow some amaranth greens there. I can't put any overwintering greens into this bed because I need to have it entirely cleared out by the end of the year so I can sow it with a mustard cover crop. Next year this bed will be home to the tomatoes and peppers. I prep the tomato/pepper bed with a winter cover crop that I dig in in the spring. The volunteer Dorato d'Asti celery plant that is behind the basil also has to go. The melon vines are starting to bloom, even though it seems to me like the vines are still quite puny. Delicata and butternut squashes are developing. The Vine Peach plants that I sowed way back in June are finally developing some female blossoms. These plants and the Kiwano Horned Melon (also sown in June) seem to really resent the cool weather. If I try them again next year I'll wait until July to start them. 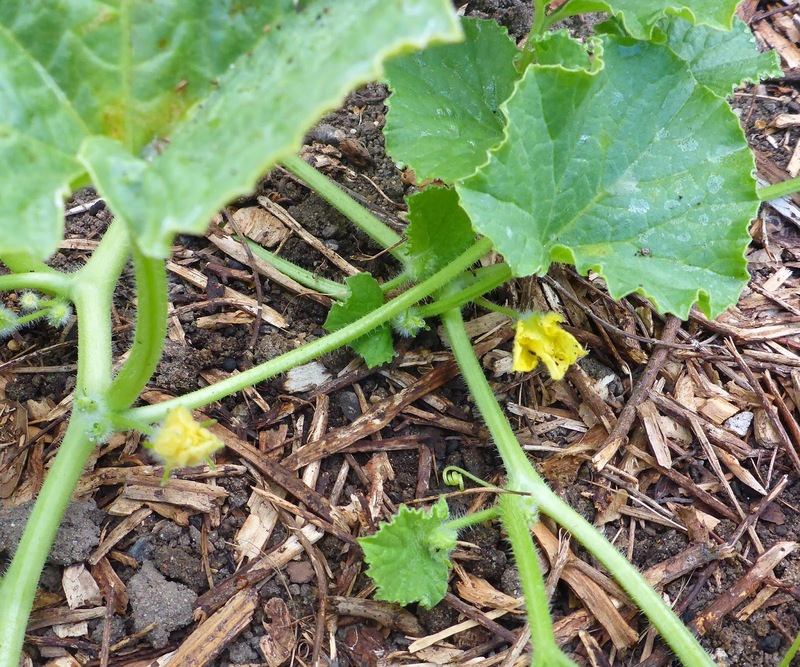 The Tasty Treat Japanese cucumber vines have grown enough that I can start training them up trellis and they have some blossoms already. The new basil seedlings are almost big enough to set out in the garden. The new lettuces (more Manoa crisphead, Jericho romaine, and Rosencrantz crisphead) are large enough to set out. 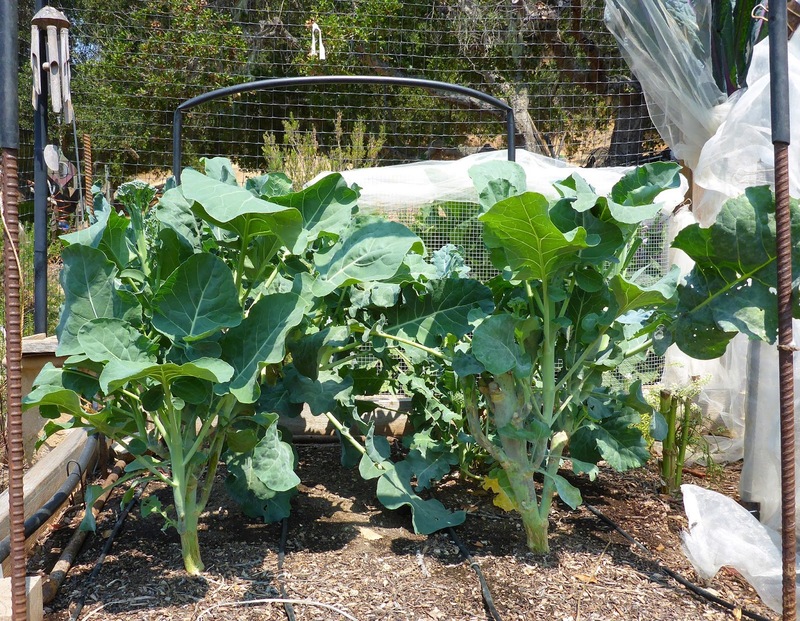 And the Tronchuda Beira cabbage and Russian Hunger Gap kale are also large enough to get into the garden. That's the latest in garden for the week. These are, rather, they were my winter sown broccoli and brokali. They were actually doing quite well still, they had recovered from the recurring rabbit and rat attacks after I covered them up. 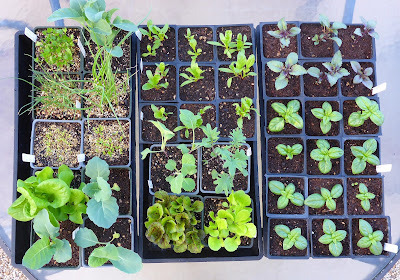 But I needed the space for the new Romanesco broccoli and cauliflower seedlings. 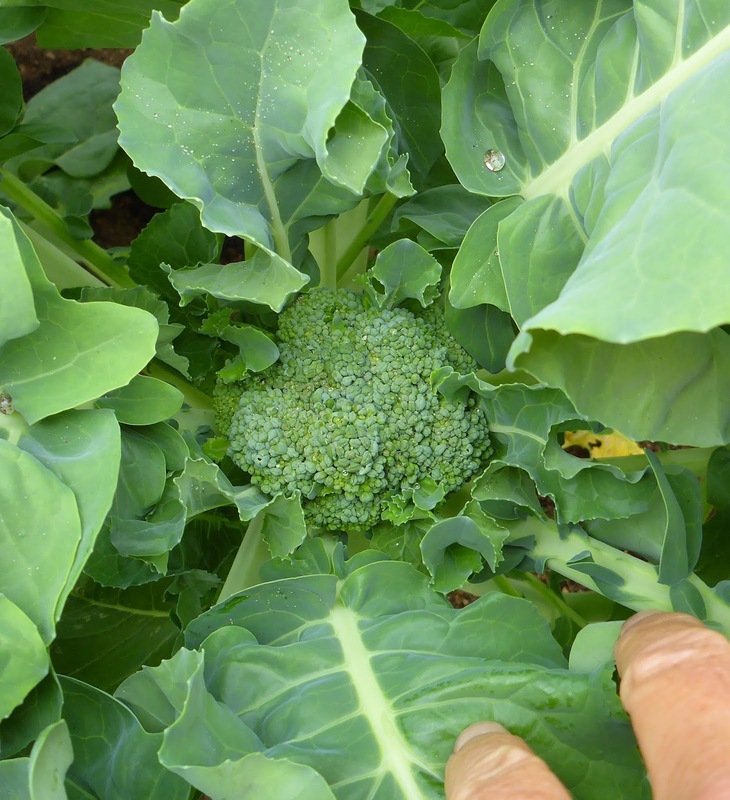 It would have been much more difficult to remove them from the garden if I didn't have 3 newer Batavia broccoli plants already producing and 3 new Calabrese broccoli plants coming along. 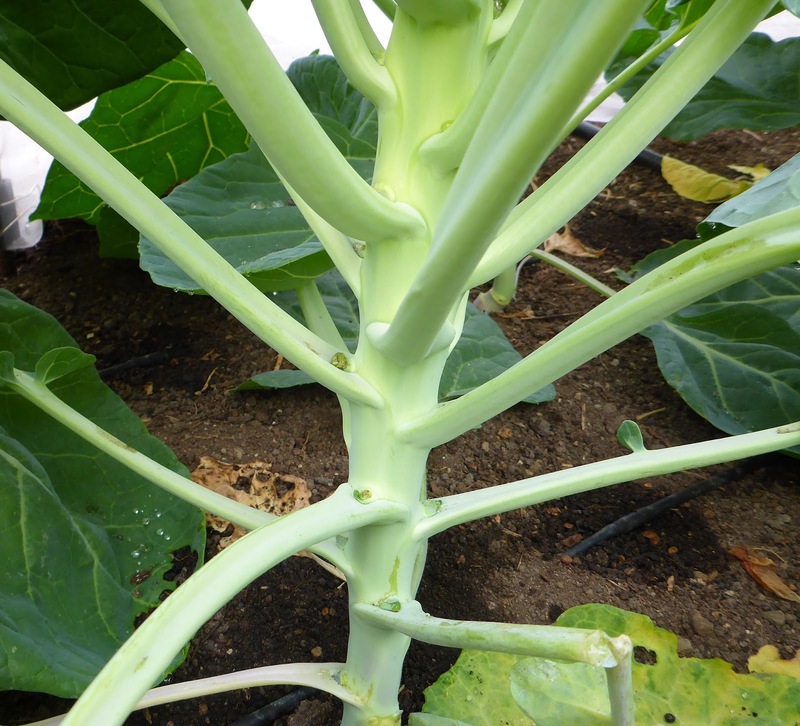 The plant above was one of the winter sown Batavia broccoli plants. It produced a beautiful main head but then none of the leaf axils had any buds. But I left it in place and eventually the plant produced numerous shoots from the beneath the soil line. I thinned those to just a few strong shoots. You can see the ugly ragged remains of the main stem and the shoots that sprouted from the base. Below you can see the shoots before I cut the plants down. And that's the replacements. Two plants each of Romanesco broccoli and Purple Cape cauliflower. I know that the Romanesco broccoli plants get to be HUGE and I assume that the Purple Cape plants will also so I gave them plenty of room. They are set out 21 inches apart, which is just the right spacing to take up 1/6th of the bed. I've got them protected with water bottle sleeves and some tulle fabric for now. Later on I may have to erect a tunnel over them for a while. 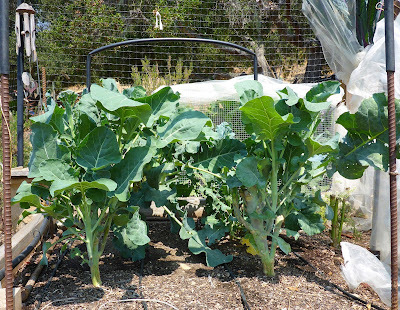 I enlarged the tunnel that is protecting the Brussels sprouts and Calabrese broccoli plants by making it higher which required using 2 lengths of MicroMesh fabric. I left a gap at the top in the hope that the good bugs (but not the bad critters) will find their way in. The first little head of Calabrese broccoli is forming. The heads on this sprouting broccoli are always small but the plants usually make up for it by producing lots of side shoots. This plant already has a number of big shoots growing from lower on the plant. The first signs of sprouts on the Brussels sprouts plants! Maybe a harvest by Thanksgiving? The lettuces are definitely showing signs of bolting. I hope there's enough room in the fridge for them all. Big salad for dinner tonight! The carrots have germinated. I hope the sowbugs don't feast. 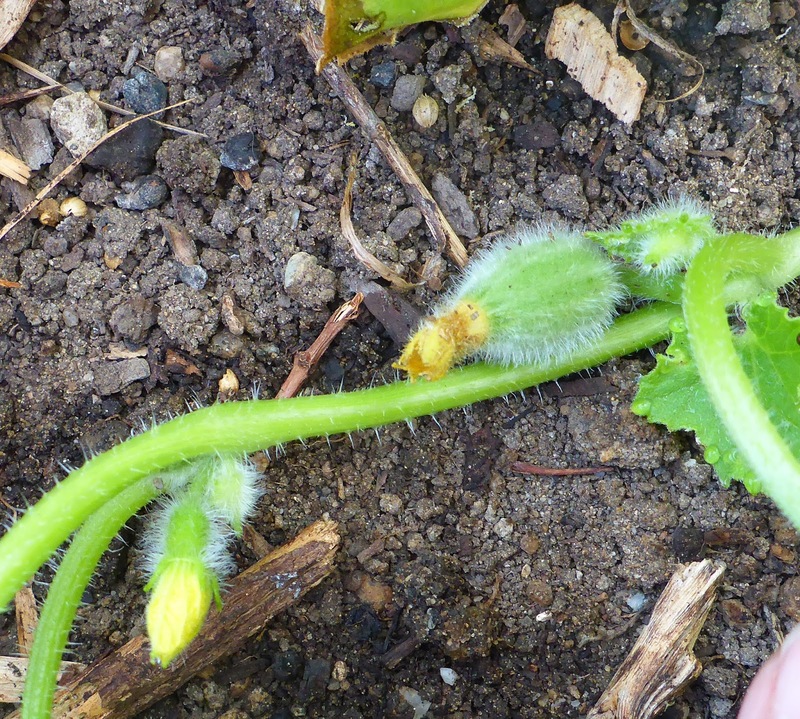 The Green Fingers cucumbers have revived a bit and are setting a few cukes. The Tasty Treat cucumbers are growing. I'm pretty confident that they will have time to produce this fall. 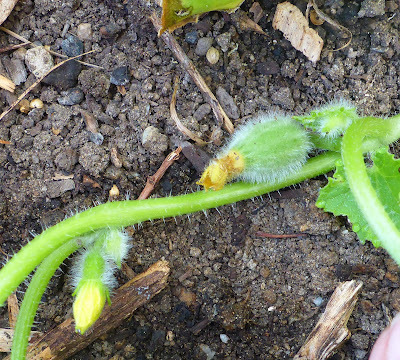 Yay, the Tromba d'Albenga squash got their blossoms coordinated and some squash have set. Not the most perfect straight specimens but I don't care. I finally got fed up enough about the raiding rats that I wrapped each pot of the Mara des Bois strawberries in tulle. It's not perfect, I've found a few spots where they've tried to munch right through the fabric. 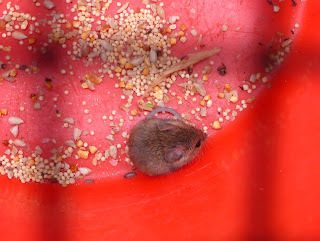 On the other hand one big fat rat went for the bait (a strawberry of course) on a trap that I had set beneath some low hanging fruit and well, that was the end. The first Chianti Rose tomato is starting to ripen. And the first Reisetomate From Transylvania tomatoes are ripening as well. And yes, they are supposed to look like that. Still waiting for the first Florina pepper to fully ripen. They are sweetest and tastiest when harvested fully ripe. The potted up IPK P 852 (Italy) plants are growing. Keep going babies! I don't hold out much hope for the Sweet Potato experiment. They are growing soooo slooowly. Perhaps if we get a few heat waves this fall they will do something. But I doubt it. Anyway, they aren't any trouble to just leave them be so I will. At least they have some pretty flowers. That gap in the Blue Speckled Tepary bean patch shouldn't be there. I thing the rabbit is plowing it's way through, munching as it goes. I'm going to try to erect a barrier around the plants. Damn, this is getting to be ridiculous. The DR won't go for the bait in the Havahart trap (however, a couple of rats have). Anyone around here want to do a little target practice? I should be harvesting Brinker Carrier snap beans pretty soon. And the 4 surviving (out of 20) Rosso di Lucca dry bush beans are growing. I really messed up and overwatered them so most of the beans rotted before they had a chance to germinate. These 4 are real survivors and I hope will provide my seed stock for next year. The Hopi Chinmark corn is in full tassel mode now. The Puhwem corn isn't showing any signs of tasseling yet but has grown taller than the neighboring 6 foot tall bean trellises. So that's the latest that's happened in the garden in the last week.